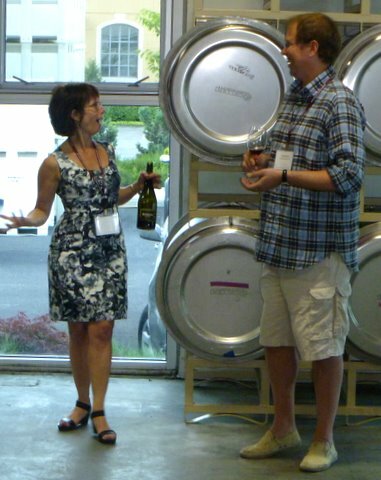 Katherine Cole, Voodoo Vintners: Oregon’s Astonishing Biodynamic Winegrowers. Oregon State University Press, 2011. You can’t come to Oregon and speak about “green wine” as I did a couple of weeks ago without talking about biodynamic viticulture. The Willamette Valley is a hotbed of biodynamic activity; Demeter USA, the national biodynamic certification organization, is even based here. And now Katherine Cole, a writer for The Oregonian newspaper and several wine publications, has chronicled the movement in her nifty new book Voodoo Vintners. Biodynamic viticulture is controversial – do a simple Google search for the phrase “biodynamic viticulture debate” and you’ll see what I mean. Organic viticulture sort of adopts Google’s motto: Don’t Be Evil. Eliminate chemical fertilizters, sprays and so forth. Biodynamics takes a different and more proactive approach that considers vineyards the way the Gaia Hypothesis thinks of the earth, as a living organism. Just avoiding harm is not enough! If you want healthy grapes you need the entire environment to be healthy and growing, from the dirt and its microrganisms on up. This sounds good enough, but then there are the cow horns and other unexpected elements of the system. Rudolf Steiner, biodynamic agriculture’s Austrian founder, prescribed certain treatments, sprays and practices that strike many as more black magic than agricultural science. Any recipe that begins with burying a cow horn filled with manure (that’s DooDoo) in the vineyard and involves special stirring instructions for the resulting organic tea to harness cosmic energy before it is sprayed on the vines (VooDoo?) is bound to have skeptics. Some wine people declare that biodynamics is bogus, a hoax. Others approach the concept with almost religious reverence. 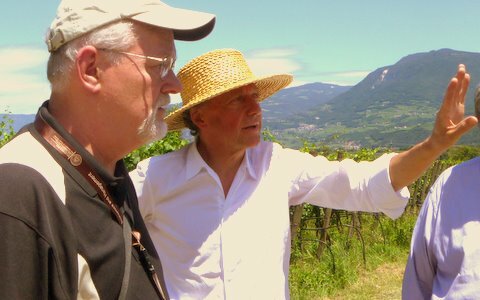 We spent an hour walking the vineyard rows with Italian biodynamic guru Alois Lageder earlier this summer and the depth of his faith was hard to miss … or to resist. He’s a true evangelical biodynamic fundamentalist and there are many who share his faith. So I approached Cole’s book with great interest. Would she argue for the fundamentalists like Lageder or side with the skeptics? The answer is neither – the book is organized around a set of profiles of Oregon wine people rather than a strong central argument. As you read the book you learn about the history of biodynamics and Rudolf Steiner, its charismatic originator. And you meet some Oregon wine growers who embrace biodynamics, some who reject it, some who’ve tried it and given up and others who like the idea, but will only go part way, It’s an interesting journey because these are interesting people and Cole is a fine writer who takes us into their lives as they weigh the costs and benefits. All very interesting … but so what? What’s the point? I kept looking for Cole’s argument and I couldn’t find it. Then, going back through the book I discovered that I had missed the thesis, which was stated in the introduction. OK, but what about the voodoo stuff? Well, Cole writes, yoga has its mystical side, too. Yoga is self-contained, holistic. … There is another, metaphysical, aspect to yoga that isn’t much discussed. … It is possible to be a practitioner of yoga without buying into the spiritual side. That’s true. I used to do yoga exercises but I was only interested in the physical (flexibility) and mental (calm) benefits. I wasn’t looking for enlightenment. Biodynamic viticulture in Oregon is similar to yoga at your neighborhood studio. Although it’s still a fringe phenomenon, it’s becoming increasing popular and voguish. Many winegrowers are dabbling it it. A small number are devout practitioners. Having read the book I think Cole’s yoga analogy is a good way to describe how wine growers in Oregon relate to biodynamics — most are pragmatists and do what they think works, although a few also embrace its more mystical elements. This is a book about the people as much as (and maybe more than) the biodynamics they practice [or not]. For all its black magic, in Cole’s telling of the story, it’s still the human element that matters most. I enjoyed Katherine Cole’s book and I recommend it, but I still have doubts. Is biodynamics really like yoga, a healthy activity but ultimately matter of personal choice? Isn’t there any scientific evidence one way or another that can serve as a guide? Well, there is a new book that examines biodynamics (and other green wine approaches) systematically and makes a strong argument that goes beyond bending and stretching. It’s called Authentic Wine and I’ll tell you all about it in my next post. In the meantime, here are some Yoga exercises for wine drinkers (hint: don’t try this at home)! What’s red and white and green all over? Wine, naturally. And naturally Oregon wineries are in the green forefront — a fact that was reinforced at a recent Wine Wars book talk. Because I was asked to talk about Wine Wars with particular attention to Chapter 14’s topic, wine and the environment, I titled my presentation “What’s Red and White and Green All Over.” Portland is a good place to give a talk like this because it is so close to the wine country and its citizens are so environmentally minded. Green wine is big in these parts. Green wine is made in the vineyard, of course (the organic or biodynamic viticulture choice), and part of it is made in the cellar (especially regarding water use and re-use, which is a significant issue almost everywhere). I’ve seen estimates that it can take as much as 120 liters of water to produce a single glass of wine if you follow the product chain from start to finish. Wow! That’s a big environmental factor. And finally there’s green wine packaging. Weighing the packaging options: Jen, Allison, Mike and Brad. 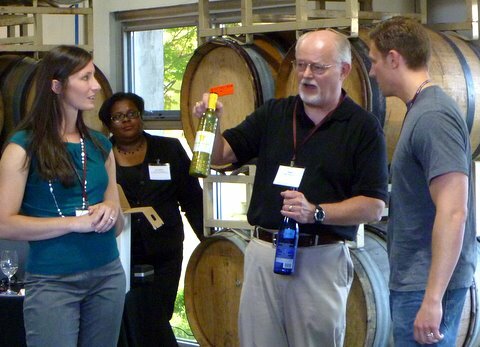 With the help of two volunteers, Jen and Brad, I demonstrated some green and no-so-green wine packaging options. The differences in size, weight and perceived quality were astonishing. Here is the tale of the scale. The Tetra-Pak is more efficiently produced and recycled and saves over 90 percent of shipping weight compared with the standard bottle, an amazing saving of resources all along the product chain. I predict that much of the wine we drink every day will eventually be delivered in eco-containers. Just as many consumers seem to have gotten over their prejudice against screw caps, I think we’ll come to accept eco-packaging as an appropriate delivery system for the ordinary everyday wines that make up more than half of all wine sales. But what about fine wine? Well before my visit to Boedecker my answer was that the eco packaging choices were pretty limited – lightweight glass was about all I could recommend since the most extreme eco choices (Tetra-Pak, for example), are not appropriate for medium- or long-term storage. They are for vins du jour – the wines you buy at 3pm and open at 5pm (which make up the bulk of total wine sales, of course). But Stewart surprised me by explaining that he had found some innovative ways to cut Boedecker’s environmental footprint without sacrificing the quality of the delivered product. How about re-using wine bottles the way we used to collect and reuse soda bottles? The idea of recycled wine bottles is very appealing, but the practical problems of collecting used bottles, cleaning, sorting and distributing them are hard to overcome. But Stewart told me about a California firm (I think he was talking about Wine Bottle Renew) that has tackled this project with success, using high tech scanners to sort the bottles (a key and previously prohibitively labor intensive process). The money and resources saved by not having to melt down and recast the glass are considerable, Stewart said, and the delivered glass is both cheaper than new, it is also actually cleaner (an obvious concern). He’s sold on recycled bottles and it is easy to see why – a trend to follow for sure. Boedecker is also riding the keg wine wave, which is another eco-packaging movement. Wineries deliver 20-25-liter kegs to restaurants and other “on-premises” establishments to fill “wine by the glass” orders with no waste. It makes a lot of sense to eliminate as much of the packaging as possible for wine that will move so quickly from barrel to glass. But keg wine is currently mostly a local phenomenon because of the logistics of recycling and reusing the kegs, which is the key to the whole enterprise. So I was surprised to learn that Stewart was selling Boedecker wine kegs in New York City. They ship the wine in bulk to New York where a local partner handles the keg operation. What a great idea! It opens up a distant market, is good for the environment and is good for the wine, too. Kym Anderson recently explained to me that shipping in bulk versus shipping in bottles can actually result in better wine because the liquid mass of the wine (up to 25,000 liters in the case of ocean container shipments) is more temperature stable than cases of wine in bottles. Cheaper, greener, better quality — a winemaking trifecta! Bulk shipping and local “bottling” into kegs is kind of a return to U.S. wine market practices in the 1930s, where California winemakers would ship bulk wine across the country in railroad tank cars. Local bottlers would market the wine, usually under their own brands rather than the name of the wine producer. This practice ended in World War II when the Army commandeered the tank cars and wineries were forced to bottle (and brand) themselves and ship cases of wine in box cars. Will keg wine take off and take us back to the future of wine? Stay tuned. Thanks to Stewart and Athena for hosting the alumni event at their winery. Thanks as well to Brad Boyl, Rainier Aliment, Renee Kurdzos and Allison Cannady-Smith for all they did to make this event a success.